Little Mrs. Married: My week so far, good books & Hoo Are You??? So, how are you? How is your week going? I just finished reading The Guardian by Nicholas Sparks. Oh.my.GOSH. Great book. NOT the romance I assumed it would be. Oh, there's definitely romance involved, don't get me wrong. But it is much more suspence. It's been awhile since a book kept me up late reading wayyy past my bedtime, but this one did that. Now what to read? I really want to read The Help. 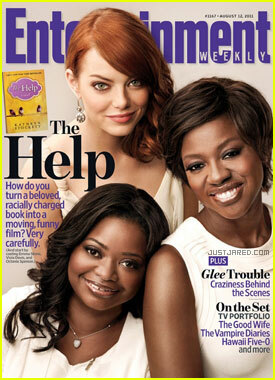 Three of the stars are on the cover of my Entertainment Weekly, which I got yesterday. I cannot wait to see that movie, and I really should read the book first! Not much else to say... just procrastinating, I supposed, from the actual work I must do! Before I run, I think I'll answer some questions from Night Owl Crafting! I just found this blog today after reading Pinklets! 1. Do you workout regularly & what do you do? Yes, maam! I do Bootcamp 3 times a week & Zumba 2 times a week. I miss every now & then, but as long as i make it 4 times a week, I am okay with that! I have been doing bootcamp since January & it's an awesome class that will work your tail off!! I just started Zumba in June & honestly, I have never SMILED so much while working out! HA! 3. How often do you vaccuum? Ohhh, man... not enough. I'll just leave it at that. 4. Do you accessorize & if so, what is your favorite thing to accessorize with? 5. What is your favorite drink during the summertime? I really can't have a lot of sugar anymore, so I drink nothing but water during the day. But i do love lemonade & sweet tea! That's it! Play along if you wanna! Ohh I love bootcamp.. especially when they have trampolines! So fun and zumba is awesome! Oh and I love to talk to my hubby to right before bed.. otherwise I love to ask him for things just as he is getting comfy! I want to see The Help, but I, like you, have not read the book. I feel like i should read the book first, but I may buck that system if i can convince my parents to watch the boys this weekend so that Drew and I can go on a date :) hehe! I have heard so much about Zumba...it sounds like I'm going to have to try it! You'll LOVE The Help! I can't wait to see the movie. By the time it's bedtime, I'm exhausted! I'm a morning person so I have no trouble there! Go you with your workouts!